Summary (from the author's website): Cynthia Holz’s first novel with Knopf Canada is a spellbinding story that offers an intimate look at family, friendship and altruism, and unrolls a cast of characters you can’t help but root for even as you question some of the things they do. Dr. Ben Wasserman, an organ transplant psychiatrist, is having trouble assessing a would-be kidney donor who may turn out to be a bona fide altruist. But as his interest in the man grows, so do his professional and emotional conflicts. At the same time, Ben’s psychologist wife, Renata Moon, is struggling to treat a phobic client whose husband died in a train crash. When the young woman reveals that she is pregnant, Renata’s disappointment in her own childless marriage is triggered anew. Ben and Renata work hard all day, then go home to squabble over the nightly take-out. It doesn’t help to ease the rising tension in their marriage that Ben’s widowed mother, Molly, has made her disapproval of her yet-to-be-pregnant daughter-in-law well-known. Nor does it help when Molly takes in a boarder, a man from her past whose secrets threaten to complicate the family dynamics even more. 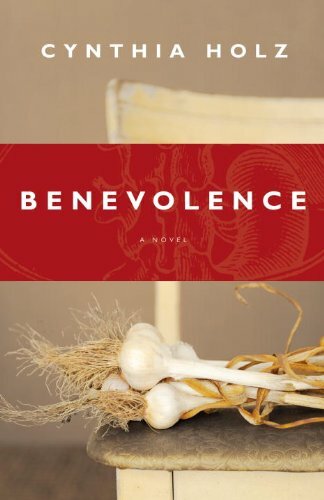 Benevolence is intelligent, amusing and deeply humane, a novel that asks unsettling questions, makes surprising connections and allows room for some unexpected, magical solutions. Disclaimer: I won this book through Goodread First Reads as an ARC. I was not required to provide a review, but chose to write one regardless. My Summary: Renata, Ben, and Molly are three people whose lives are connected, yet infinitely separated; Ben and Renata are married, and Molly is Ben's mother. Ben is a psychiatrist and Renata is a psychologist, and the couple are trying to maintain their marriage despite their hectic schedules; thought their marriage has been rife with disappointments: Renata and Ben are unable to conceive any children, and Ben is often more interested in his poetry than Renata. And of course, each person has their own secret, buried deep in their past. These - along with some other memories best forgotten - are brought to the surface when Ben, Renata, and Molly each meet someone that ultimately changes their perspective on life. My Thoughts: This is one of the only 'adult genre' books I've read, and at first I was a little reluctant to do so; I wondered how in the world I was supposed to relate to the characters when they were more than double my age? Needless to say, I pushed aside my reservations and dove right in. And I wasn't disappointed! Having been a YA junkie for the past couple of years, I'm used to the fast-paced build-up of a plot and a looming conflict, but I really enjoyed the change of pace! Benevolence kept a fast enough pace to keep you interested, but it was subtle enough that you never felt overwhelmed with what you were reading. I really enjoyed that, and I found myself understanding the plot better. I also really enjoyed the use of flashbacks in Molly's point of view! She quickly became my favourite character (along with Stella). Final Thoughts: If you're looking for a beautifully-written novel about friendship and love and what it takes for a marriage to work, I definitely recommend this one! I'm the other way - I'm 25 now and readng YA books make me feel old, and not in a good way! Benevolence sounds like an interesting read, it's gone on my wishlist.